Gorgeous home in great location! Only 1 prime summer 2019 week left. Check our calendar and book quickly. *Saturday - Saturday rentals during Summer, but flexible during off peak season. 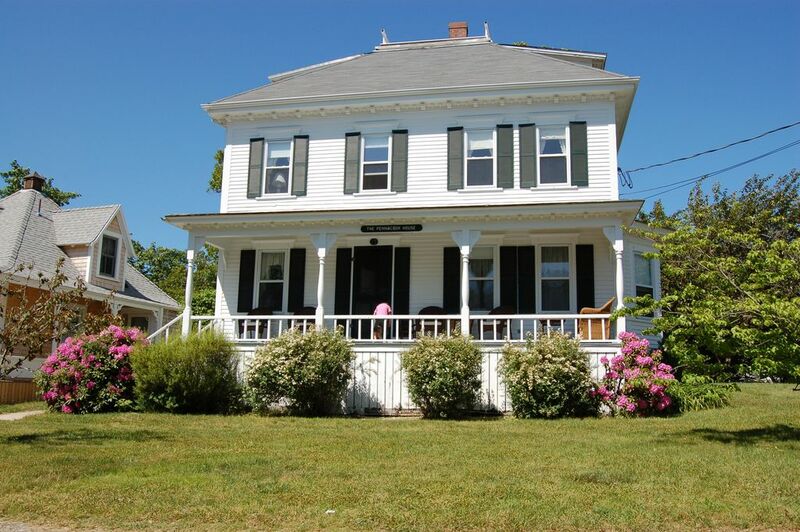 The Pennacook house in Oak Bluffs on the charming island of Martha's Vineyard is beautifully maintained, bright and sunny, with a large eat-in kitchen, living room, dining room, and library with WIFI. Play outside on the large lawn, relax in the hammock, watch sunset from the front porch and enjoy cookouts at the huge picnic table. 6 bedrooms, 2.5 baths and a fantastic outdoor shower. No car needed! Walk just a few blocks to beach, town, tennis courts, basketball courts, playground, bike paths and bus stop. Fully renovated with updated kitchen, baths and windows yet fully restored period details, this historic home is well built and is wonderful for holiday gatherings in every season. Linens: Please bring your own sheets for 4 queens and 3 twins, pillow cases, and towels, or rent them. Linen rental is available from Takemmy Linen Rental. They will deliver and pick up. We value your feed back: We try our hardest to make The Pennacook a wonderful vacation home. Please let us know your suggestions for improving this home or the rental experience. The Pennacook House is a wonderful place for family gatherings, play and relaxation, with island activities for all ages right near by. Though we live in Colorado, my husband and I love visiting the island with our twins and having our east coast relatives come stay at the Pennacook House with us. My husband and I visited Martha's Vineyard in the spring of 1994 and fell in love with the island and the town of Oak Bluffs. We found the Pennacook House for sale, bought it and spent the next year completely renovating it. We love the island in winter, too! It's peaceful and ideal for long walks or cozying up on the couch with a Latte from Espresso Love. Ideal location. This house is just a special place - it has a great feel: Gorgeous period details. Modern conveniences. Lots of light. Excellent lay-out. Lovely private outdoor shower is great for washing off the beach sand. Please bring your own towels. Great cell reception from all major carriers. Landline for emergency or local calls. Central heat. Gorgeously designed cast iron radiators in each room. Propane oven and 4 burner stove top. Formal dining room seats 8-10 with china hutch and sideboard. Home is on a double lot so the side yard has lovely lawn to play on. Wifi. Huge picnic table with umbrella. Lovely hammock. Car not necessary because town and beach are within easy walking distance. The rest of the island is easily accessed via bike, bus or taxi. If you choose to bring a car, there are 2 off street spaces available and you will need to make ferry reservations with the Martha's Vineyard Steamship Authority to book passage from Wood's Hole, MA to either Oak Bluffs or Vineyard Haven on the island of Martha's Vineyard. We had a crew of four people staying here and they couldn't have been happier! Rebecca did such a great job making sure everyone was comfortable! Linens are a snap to rent and are delivered and picked up and the house has everything you could need. Thanks, Rebecca! This property was even prettier than the pictures made it seem. It was the perfect hangout spot for some of our younger wedding group. Our family has been vacationing in Oak Bluffs for many years and this was the best ever! This house was perfect for our family of 9 including many elderly members. We especially loved the enormous kitchen, backyard and lovely dining room. The location could not be better with short walks to the beach, shops, restaurants and gingerbread houses of the campgrounds. We are so grateful to have had this wonderful house! I am so glad you loved our house! It’s a very nice, large home that is a short walk to Oak Bluffs town center. We held a small workshop at Pennacook. The space in the home was perfectly wonderful and suited us all very well for community meals, comfortable sleeping, and learning. The location is a close proximity to the ocean, shopping and offers wonderful pedestrian friendly fresh air walks! The house had everything we needed for the comfort of all. The only drawback, as it is mid-November, the heating system didn't provide a great deal of heat to the third floor bedroom space. Overall, everyone was happy with what was provided. Lovely older home...3 floors so rare for the Vineyard. Great for all of the family to spread out! We were here for a family wedding and had more than enough room for everyone. The kitchen and dining room are spacious and well equipped and came in handy for the impromptu meals for visiting friends and family. Nice backyard and great outdoor shower, personally my favorite. Also a very short walk to Circuit Ave and all the shops and eateries and Ocean Park! Don't usually need this big a place when visiting but if I ever do again I would certainly rebook here. Only one negative comment was that we rented toward the end of the season, when most yard work is at an end. The Island had just had a storm before we came and the walkways and the yard were a bit littered with sticks and such had to clear those away for some of our elderly visitors to prevent falls. I'm so glad you enjoyed my home. I am sorry about the leaves and sticks on the walkway after the storm. I live out of state and so did not know about it. I wish you had contacted me or my caretaker, we would have had it cleaned up for you right away. Martha's Vineyard Island has wonderful activities from biking to beaches to dining and shopping. Our house is close to all the activities offered in Oak Bluffs. It is an easy bike ride (miles of bike paths), bus ride (the bus stop is close) or drive to the rest of the island. 4pm Saturday - 10am Saturday rental period, I can often offer some scheduling flexibility in the off-peak season. Multi week discounts offered. 50% deposit due at signing to reserve your week. $500 refundable damage deposit.